In today’s world we’re overloaded with information from multiple places. It’s delivered to us every day through social streams, email messages, and the web. Wouldn’t it be great if you could easily harvest, filter, and view this information from these multiple channels, and then find the data nuggets and ideas that are important to you? This is exactly why we created Pro.Inbox. Pro.Inbox boosts your productivity by gathering the information that you care about from social, email, and the web and presenting it to you all in one app. In fact, it’s the first mobile app to make email, web and social streams actionable from one place. Watch the video below to see how Pro.Inbox can boost your productivity — starting today! LifeTopix and My.Agenda are personal organization apps for iPad, iPhone, and iPod touch. Both apps are especially useful for those who utilize David Allen’s Getting Things Done® (GTD) method. The GTD method is an excellent method for organizing your schedule and getting things done for both life and business. At LightArrow, we’re constantly incorporating features that are useful for GTD, and we enjoy sharing our best practices for using these features. In this post, I’ll show you how you can use LifeTopix for the Doing Phase of GTD. Keep in mind that our starter app, My.Agenda, can include many of the features discussed by purchasing the Get Things Done Pack as an in-app purchase. If you’re not familiar with GTD, it’s “the groundbreaking work-life management system by David Allen that provides concrete solutions for transforming overwhelm and uncertainty into an integrated system of stress-free productivity,” according to David Allen’s website. Allen lays out five key phases of the GTD process, which include 1) Capture/Collect, 2) Process, 3) Organize, 4) Review, and 5) Doing. This post focuses on the Doing Phase of this workflow. In earlier blog posts, I’ve described the first four phases. Refer to the following links to better understand how to use LightArrow apps for GTD. What is the Doing Phase of GTD? No matter what system you’re using, it’s incredibly important to take action on your projects and units of work (tasks). In GTD, the Doing Phase is about making choices and taking action on items based on the context, time available, resources, and priorities. The types of items that you execute on are primarily tasks; however, in LifeTopix you might also be acting upon notes, appointments, trips, visits, events, gifts, and shopping lists. When using LifeTopix, we suggest that you review your action lists daily and choose the items for which you wish to act. This post focuses primarily on tasks and appointments, but keep in mind the principles are similar for most actionable items. If you’ve properly executed the phases of Capturing, Processing, Organizing, and Reviewing, then you should be able to easily proceed with the Doing Phase. When using LifeTopix for the Doing Phase, focus on the items described in the following sections. LifeTopix provides context tags for adding metadata to any type of object, no matter what system you use. 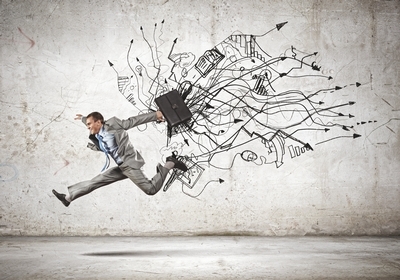 Fundamentally, tags are used to describe the data for organizing purposes. In GTD, contexts are assigned to help you determine if you’re at the correct location and have the proper resources to complete a job. You can use LifeTopix’s context tags for GTD contexts. Take note that you’re more productive if you perform tasks, such as making phone calls during chunks of time, rather than switching to a different task — such as going to the grocery store to pick up milk and then finishing phone calls at a later time. Examples of GTD contexts are @office, @home, @grocery store, etc. In LifeTopix, you can set any context you wish and you can assign multiple contexts to items. You access the My Contexts view by tapping the “tag” icon, as shown in the following image. The My Contexts view assists you in making choices about the jobs you wish to complete daily. This view shows all the contexts that you’ve set up. You can drill down into the contexts to see their tasks and other items by tapping the items in the list. In the My Contexts view, I’ve chosen the context of @home. The following image shows the tasks to which I’ve assigned to this context. Once you’ve selected a task from the My Contexts view, you can view the task detail to further determine if you have the time to complete the job. You can also determine if the item is a priority. The following image shows the fields that help you to decide on an action. The image below also shows how you can assign the action to the current date. Assigning a date allows you to easily locate and view the task in the Agenda view. When you assign a due date to the current day, the task appears in the Agenda view, which makes it easy for you to view and edit your upcoming tasks from one screen, as shown in the following image. In the above image, notice that the “Write 10 pages” task appears in light green, indicating it’s the next action to complete. Another method for choosing your daily tasks is to review your Task Lists in LifeTopix. In the Tasks + Projects topic of LifeTopix, you can access all your tasks in one view, which is the Task List view. You can drill down into each task to determine if you have enough time to complete the task and whether or not the task is flagged with a higher priority. This view is shown below. We realize that it’s crucial to choose daily tasks based on many factors, and that priority and context are of upmost importance. Therefore, in our upcoming release of LifeTopix, we’ve made it easier to choose daily tasks by adding more choices for filtering task views. 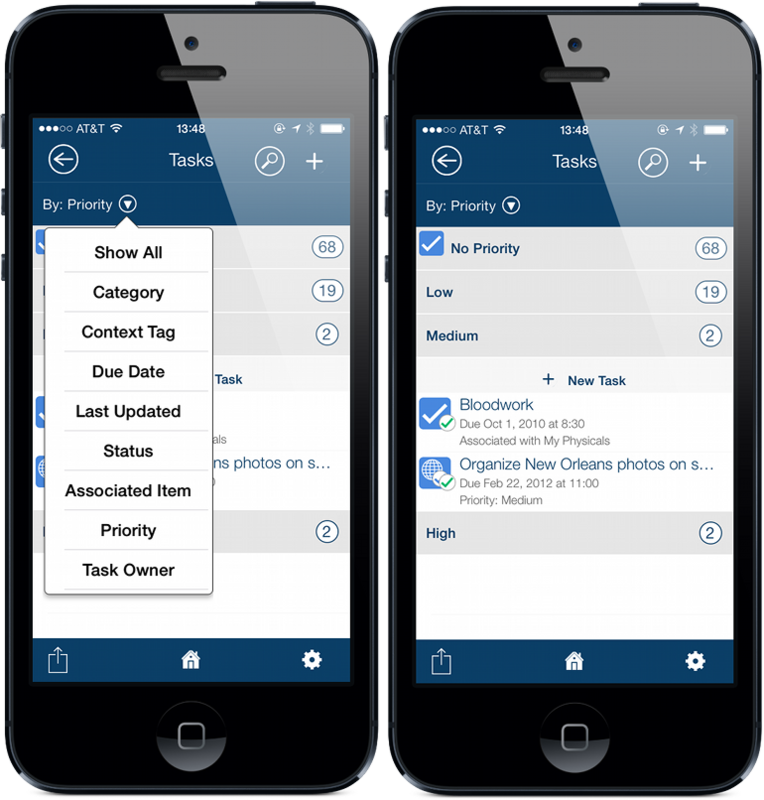 You will be able to view tasks by All, Category, Context Tag, Due Date, Last Updated, Status, Associated Item, Priority, and Task Owner. This allows you to better choose items based on context, time, resources, and priorities. These new choices are shown in the following image. Hot Lists are exactly what the name implies — items that have a high degree of importance. Hence, we created the Hot List view for those “Hot” items. The Hot List gives you easy access to your favorite and most commonly used views and items by aggregating them into one place. This saves you time in navigating to frequently used views, items, and resources in LifeTopix. At LightArrow, we realize that when following the GTD method, you might not want to set due dates for tasks that do not have hard deadlines. In LifeTopix, we recommend adding the due dates so you can easily view your items in one place (the Agenda view); however, if you prefer not to assign due dates to tasks, you can add these items to the Hot List. Note: In many LifeTopix list views, you can tap and hold an item to add it to the Hot List. Subsequently, you can view your chosen items directly from the Hot List, which you access from your Dashboard, as shown below. Actions that must be completed at a certain date and time (with hard deadlines), such as classes, meetings, doctor’s appointments, kids’ activities, etc. are handled easily by LifeTopix. Specifically, LifeTopix allows you to define these items by Appointments, Bill Payments, Events, Dated Notes, Occasions, Medications, Activity/Wellness, and more. LifeTopix has a variety of choices for viewing the calendar. LifeTopix includes a main calendar that allows you to pick and choose the types of items that display on it. The app also includes specific calendars for tasks, events, and trips. You can view the calendar by Day, Week, Month, and Year. If you want to see these calendar views in detail, refer to Not Crazy About the iOS 7 Calendar App – Here’s the Answer. In the Month and Day views, you can easily review the items that you scheduled for the day, which helps you to decide on the other tasks that you’ll work on daily. The following image shows an example of the Month view. In this view, you can see all the dated items that you’ve assigned for the day — all in one place. Keep in mind that your dated items also appear in your Agenda view, which provides a good list of your jobs, events, and appointments for the current day and the upcoming week. Of course, completing your important tasks is the ultimate goal when your intention is productivity and getting things done. Doing the work is up to you, but LifeTopix makes it easy to mark your tasks as complete. You simply set the Status to Completed and enter a Finished On date. This way, you have a record of when you complete the task and you feel a sense of accomplishment when you see your important items crossed off. The following screenshot shows the fields where you indicate status for a task. Once you’ve completed your tasks, you can view the completed task list by filtering by all tasks, as shown in the following image. Take note, in our upcoming release, you’ll have the ability to view your tasks by status, as shown earlier in this post. As I mentioned, if you’ve properly focused on the first four phases of GTD, then the Doing Phase should be a breeze. Please comment and let us know how you implement the Doing Phase and let us know if you have suggestions or questions. GTD® and Getting Things Done® are registered trademarks of the David Allen Company. LightArrow Apps are not affiliated with or endorsed by the David Allen Company. Organizing your life and business can be difficult, especially when there’s so many appointments, events, meetings, and projects that you’re juggling. And as a matter of course, you have supporting documents for many of your projects and meetings, and it’s always difficult to find those documents when you need them. You can print them and store them in file folders that clutter your office space or you can save them to your hard drive and risk the chance of hardware failure and losing them for good. So what’s the solution for keeping these documents stored safely, easily finding and retrieving them when you need them, and making them accessible wherever you go? LightArrow and Box have teamed up to solve these problems. Imagine you’ve started a new project and you have a weekly meeting to discuss all the logistics. Your boss calls you while you’re at the airport and needs to know the specific details about deadlines and the roadmap. You can pull up the project in LifeTopix then and there, and access all the supporting files containing the weekly meeting notes from the LifeTopix project. Or, perhaps you’ve moved to a new city and you need to start preventive care for your pets. Instantly access a Health project in LifeTopix and locate photos or scanned documents of your pets’ vaccination records. With LightArrow’s new integration with Box, you are now able to easily associate your files that are stored in the cloud with Box to LifeTopix projects, products, events, trips, visits, notes, services, service providers, metrics, subjects, and assets. Imagine having the ability to link tasks, checklists, appointments, reminders, bookmarks, files, audio, photos, videos, notes, expenses, services, and shopping items to your projects. And picture how impressed your boss will be when you answer his or her questions on the spot, while on the go. And if you’re using more than one iOS device, you can also use Box for device-to-device sync — keep data on all your devices the same. Go to www.Box.com and set up an account if you don’t already have one. Create and store your important documents and files in Box. Go to the App Store and purchase LifeTopix. In LifeTopix, tap Settings and then Logins for Integrations. Under the Box section, add your Box account. 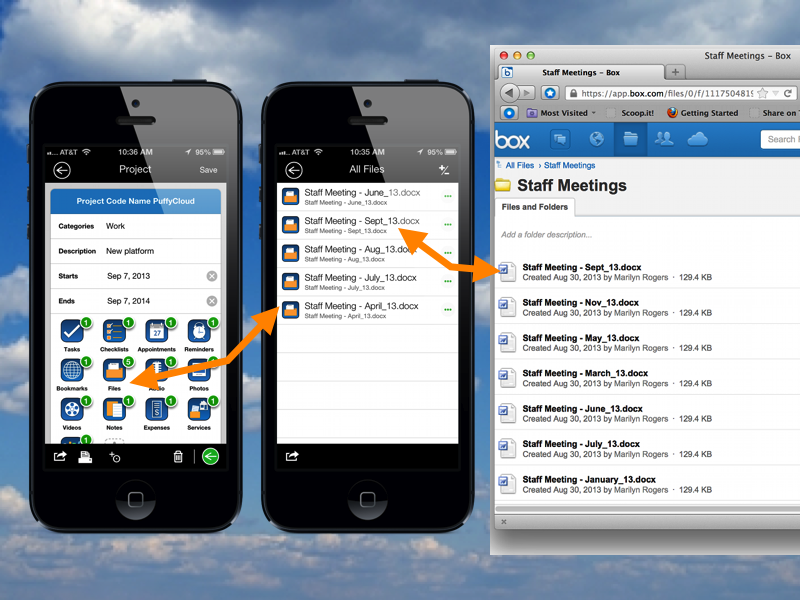 In the LifeTopix Notes + Files topic, add your Folders and Files from Box by tapping the Folders and Files tiles. Associate your files with LifeTopix projects, products, events, trips, visits, notes, services, service providers, metrics, subjects, and assets.